It’s a belated post, so… Happy Belated 240th Birthday, America! Speaking of which… what vegan* treat did I spring for this year? Limited by my restrictive diet, I wanted to find a suitable take of the rice crispy treat! While I was never really a fan of marshmallow, I couldn’t resist it in the from of a sweet, chewy and crunchy, homemade rice cereal treat. It’s been a lingering artifact since childhood, I can’t seem to stop in a coffeeshop and give the anything but lustful eyes when I see it in the pastry line-up. I knew, then, that I HAD to make sure that I could create a vegan version. The internet search began and I’ve quickly discovered the mystical properties of rice syrup, which is the key behind this deliciously red-(white-)and-blue berry-filled rice crispy treat. The result was a sweet, chewy, and crunchy treat; just what I was going for! The dried berries were a perfect sweet-tart accent and proved an easy way to add another flavor dimension. These were a hit at the picnic I brought them for, and I’ll definitely be making more for future summer events, playing around with different flavor profiles and mix-ins! 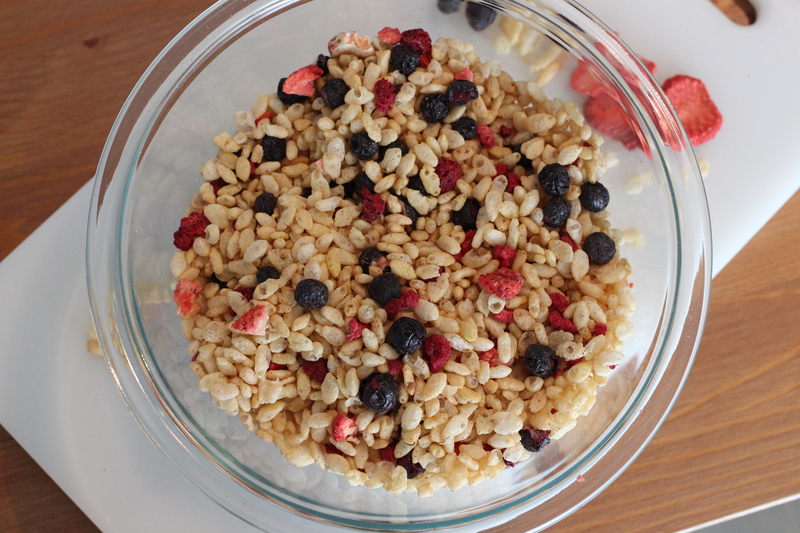 A vegan take on the the well known cereal treat featuring brown rice syrup and colorful, flavorful berries! 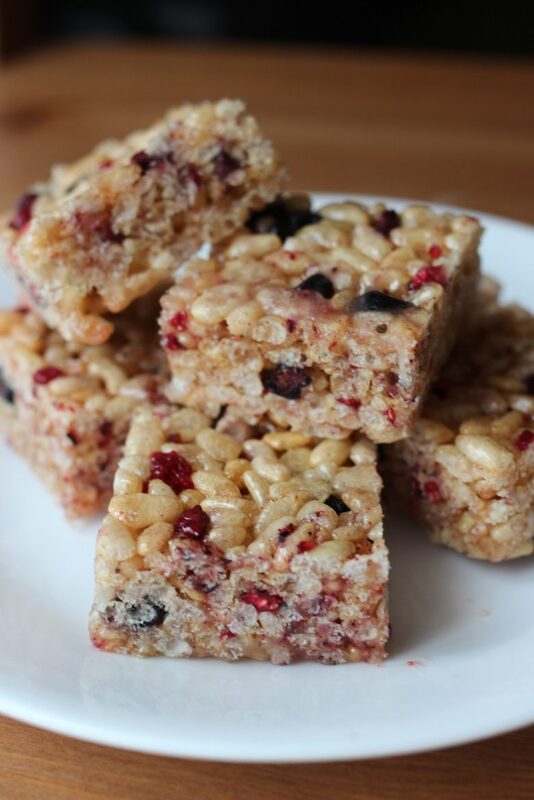 Sweet, crunchy, and chewy all in one; it's a great anytime-of-day snack! Prepare an 8x8 or 9x9 square pan by lining with parchment paper. 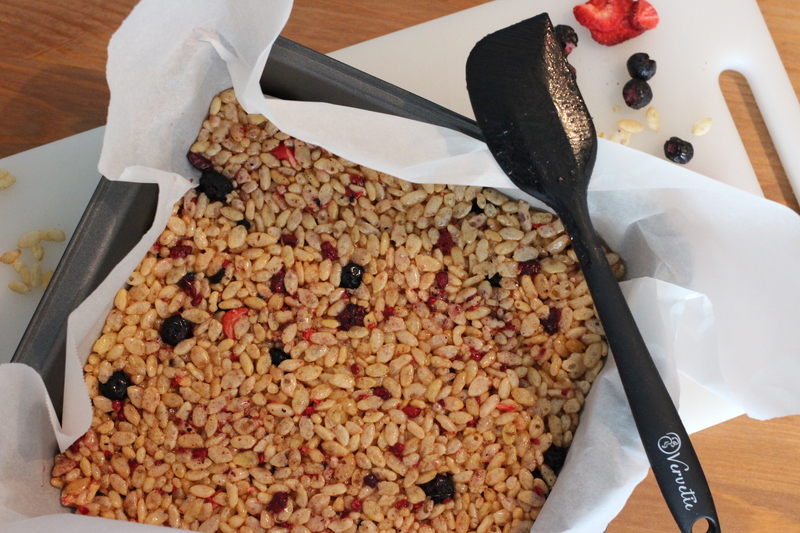 In a large bowl, combine rice cereal with freeze-dried berries to distribute as evenly as possible. In a small saucepan, heat rice syrup and coconut oil together on medium heat until boiling while constantly stirring with rubber spatula, keeping on heat for 1 more minute after mixture boils. Remove bubbling syrup from heat and stir in vanilla extract and salt. Carefully pour syrup mixture over cereal mix in the large bowl, use spatula to mix the rice crispy mixture, evenly coating the cereal with syrup. 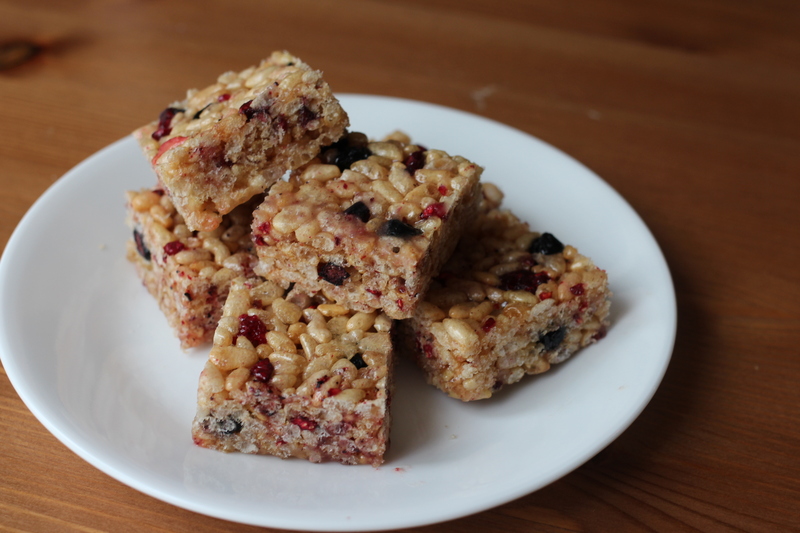 Pour rice crispy mixture into the prepared square pan and spread evenly, pressing and packing the cereal down with the spatula. Let rest about 60 minutes in fridge, or 20 minutes in freezer to set. To serve, bring to room temperature and slice into 16 squares (4x4) using a sharp knife. Enjoy! These rice crispy treats can easily be made ahead of time and stored in a sealed container in the refrigerator or freezer until ready to serve.